Clear, colorless, non-yellowing sealer coat for concrete floors. Formulated to improve, protect, and seal concrete for a longer life with excellent color and gloss retention. 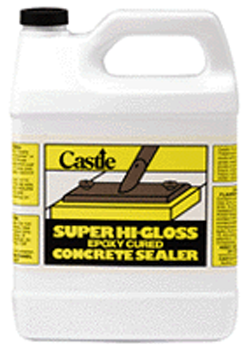 Castle® Hi-Gloss Sealer™ is perfect for problem surfaces such as porous, frequently mopped, and worn floors. It prevents penetration of water-borne and oil-based stains. This resin product also resists dusting, black marking, and abrasion. 1. Strip floor with Castle’s Liquid Concrete Cleaner or CCP. 2. Rinse thoroughly, allowing time to dry. 3. Apply thin coat with clean mop or wax pad. 4. Let dry and apply a thin second coat. 5. Air dry time at 77°F, 50% humidity. 6. Set to touch in 2 hours, dry hard – 24 hours. 7. Coverage is 300-500 square feet depending on porosity. Do not store with strong oxidants. Keep container closed when not in use. Store at temperatures of 40-90° F.